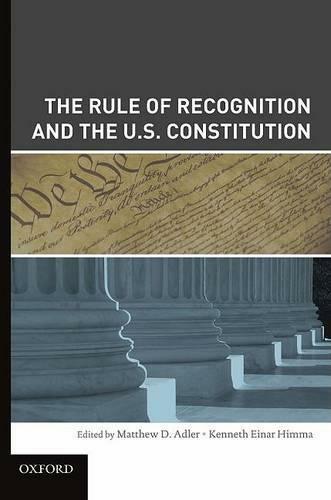 The Rule of Recognition and the U.S. Constitution is a volume of original essays that discuss the applicability of Hart's rule of recognition model of a legal system to U.S. constitutional law. The contributors are leading scholars in analytical jurisprudence and constitutional theory, including Matthew Adler, Larry Alexander, Mitchell Berman, Michael Dorf, Kent Greenawalt, Richard Fallon, Michael Green, Kenneth Einar Himma, Stephen Perry, Frederick Schauer, Scott Shapiro, Jeremy Waldron, and Wil Waluchow. The volume makes a contribution both in jurisprudence, using the U.S. as a "test case" that highlights the strengths and limitations of the rule of recognition model; and in constitutional theory, by showing how the model can illuminate topics such as the role of the Supreme Court, the constitutional status of precedent, the legitimacy of unwritten sources of constitutional law, the choice of methods for interpreting the text of the Constitution, and popular constitutionalism.